Today saw the launch of a new website - scottishnews.scot. 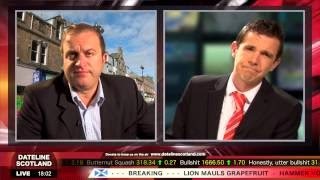 It comes from the same people who brought us Dateline Scotland during the referendum campaign - if you're not familiar with it, you really should seek it out on YouTube - it was the most honest of all referendum news reportage - a point I'd happily debate with any challengers. What they're doing now is an altogether more serious look at the news in Scotland. Looking at news output on the telly today; we get some UK-wide news, English local news dressed up as UK-wide news, undisguised English local news then the news 'where we are'. When put up against the turgid output from the BBC; Scotland 2014 (already near it's sell-by-date) the head-up-it's-own-arse Newsnight & Daily Politics etc and the slightly less plodding efforts from STV (Scotland Tonight) and Channel Four - Scottish Evening News looks like a refreshingly original take on the news in Scotland. Currently - even in Scotland-only broadcasts - our current affairs stories are often relegated to the 'and in other news' section. With this new set up, the 'English' news we get as headlines will make up the 'and finally' stories and Scottish current affairs - from where ever it comes - will be given the time and analysis it deserves. I was donating £10 a month to Yes Scotland, its now going to Scottish News. I've never had a TV licence, if I did, I'd cancel it and give it to them. People hesitate to donate to these types of internet-based entities because of their intangible nature but think nothing of buying a daily or weekly news paper. While those publications are tangible, the contents are inevitably tainted by the political views of those who own the titles - which ever way they may lean. At least with this new set-up, Scottish news will be given the prevalence it deserves instead of being sidelined by stories that have no impact on Scottish Daily life. There is broad agreement that what lost the referendum for the Yes campaign was a biased media - so this is an important step in the on-going journey toward independence. Plus, because of the unique way Scottish Evening News is funded - it'll behave pretty much exactly like how the BBC is supposed to but doesn't. But then, I'm a bit biased myself, I'd happily pay cash-money to get Dateline Scotland back. It would still easily provide the most accurate & incisive assessment of the news in Scotland. Heck, the Dateline Scotland Ticker-Tape App is just waiting to be written. If you're watching the videos on YouTube, they're worth keeping an eye on, even if you have to watch the videos twice. Anything that provides accurate information to the masses has to be a good thing. It will be rubbished of course and ridiculed but hopefully something that people will watch which will then attract some income etc. Lord knows we need something in this country as far as honest media goes. Look how little coverage the Catalonia Referendum got, disgrace. They did sterling work with Dateline Scotland, it would need to be less frivolous of course, but its a decent start. I cancelled my tv licence, and in fairness, I disconnected my tvs from the aerial (not that I ever watched them anyway). I pay the licence fee to the local food bank instead on the basis that I'd rather kids had food than the top rung of the BBC could fly first class to New York. Not an unreasonable preference for a human being, I'd say, although I'd not expect the BBC management to think that. I did make an initial donation to Scottish News, and will make more in the future. Christmas presents this year will be to good causes (like this) rather than buying tat for people who don't really want it and certainly don't need it. diverting money to more deserving causes is always a good thing to do. I don't pay for TV licence and wouldn't anyway so happy divert that cash and a wee bit more here and there. As for xmas presents, I don;t buy any anyway on account of my extreme bahhumbuggishness, my attitude to christmas precedes me always. Actually I'm pretty much the same. I'v worked for too long with people who go through hell to try to buy things for their kids. And they are still paying off last year as they are borrowing for this year. I'd love to take a pile of kids who will get nothing, and get no meal, to a really nice place and feed them up and give them some really cool gifts. Or better still we should simply stop the whole miserable bloody carry on. It started in f*$king September this year!!! Still, no chance of that. It's the only time in the year that the Brit economy actually works, even if all we buy was made in China. Our office used to get a list of kids from social work/sick kids wards. You just had initials, age , boy/girl and a short description of what ever their challenges were & their interests. We picked one or more (some kids got multiple gift-givers it was so popular) and you bought them a wee present. At the risk of sounding soppy, I derived selfish amounts of pleasure in buying for someone - that I'd never know who they were and vice versa just magnified it. Some of these kids would be getting nothing otherwise and while I'm not a fan of the rampant grasping that goes on around this time of year - these kids deserved a break. If you can get a group of people together to do something like this, you won't ever regret it. My mum's church used to organise parcels to kids in an orphanage in Romania. I'd recommend it for anyone. I don't think it's at all soppy Paul.